As the ravenous ThyssenArt Beast proceeded to eat its way through Malaga’s hot, sleepless nights, the Board of the Museo Carmen Thyssen-Bornemisza Foundation met for the very first time, presided over by ‘Our Precious Lady Carmen of The ChaChaCha’. It seemed fitting for such a splendid occasion that it occurred in the town’s ‘Great Hall of Smoke and Mirrors’, which glittered proudly for ‘Carmen The Accumulator’s’ reunion with Vice-Presidente Francisco de la Torre (conservative mayor of Malaga), councillors Miguel Briones, Mariluz Reguero and Pedro Moreno Brenes, Tomas Llorens (former director of the Museo Thyssen Madrid), Guillermo Solana (current director of the Museo Thyssen Madrid) and one Teresa Sauret Guerrero. Only the identity of the other three members of the eleven-strong MCTBF board remained shrouded in deepest mystery. Now, for some time, the unruly Izquierda Unida and their friends had been the lone ‘voice in the wilderness’, most un-‘preciously’ questioning the wisdom of spending tens of millions of Euros of taxpayers’ money on refurbishing crumbling provincial palaces to create more Thyssen Museums, bearing in mind that the Thyssens’ ‘precious’ immortality had already been subsidised in the country’s capital for twenty years to the tune of some 500 million Euros. 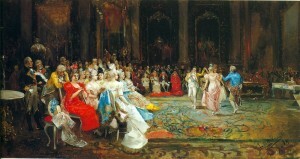 The main concern was the question of how many and exactly which of ‘The Baroness’s’ 1000 paintings – valued by The Great Art Expert herself at 800 million very ‘precious’ Euros – would eventually be housed in the new great institution. The only words crossing Her Magnificence’s own rose-scented lips was that they would all be ‘very nice’ and ‘very…..precious’, a view shared whole-heartily by the other defenders of The ThyssenArt Beast, all of them interested parties in their own ‘precious’ ways. And so, as Mayor de la Torre opened the day’s proceedings, it looked like any remaining dissent could finally be quelled once and for all, when the solemn declaration was made that there would be not one but…..EIGHT (!) 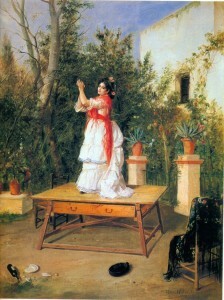 collections at the Carmen Thyssen-Bornemisza Museum in Malaga, and that these would comprise ‘romantic landscapes’, ‘naturalist landscapes’, ‘naval paintings’, ‘old masters’, ‘pictures from between the centuries from Tradition to The Renovation’, ‘portraits of Andalucia and Spain’, ‘costumbrism’, and, finally…..: ‘PRECIOUSCISM’! Unwaware that this was just a word created during a game of scrabble between Guillermo Skywalker and Anikin Rosenthal, the common folk at once began to cheer uncontrollably. Men threw their hats in the air and women frantically fanned their flushed cheeks, while everyone whooped and hollered in manic delight: ‘It’s a miracle! My God, a miracle! What a great Baroness she is, Our Lady ChaChaCha. She is so beautiful and so good to us! We are so utterly greateful to her! Long may she live! Long may she live!‘. Indescribable scenes of sheer, ‘precious’ ecstasy ensued, the crowd chanting ‘Pre-cious! Pre-cious! Pre-cious! Pre-cious!’ until their voices grew hoarse. Finally, The ThyssenArt Beast’s old Jedi Master, Yoda Llorens, managed to regain control over the hysterial mob and delivered his coup de grace: the museum’s Mission Statement. Apparently it was ‘the intention of the museographic contents of the new art centre’….‘to mould a picture of Spanish society, and of that of Andalusia in particular, beginning with the romantic period and stretching through to the begining of the 20th century’. Here the breath of the common folk was held for some time as they struggled to grasp the true meaning of the Jedi Master’s wise words. Stunned silence pervaded the air, until, out of the blue, one lone voice of dissent, Al Panpan, spoke out: ‘This picture of Andalusia which you are planning to ‘mould’, is a manipulative and unreal picture which was constructed from afar and represents the starting point of all the problems that came crushing down on us in the 20th century. I propose that Carmen Cervera inaugurate her new little museum wearing flamenco flounces and that the mayor joins her dressed up as The Joker’. Security pounced at once, bundled up the obviously insane lone critic and quickly ushered him off to an uncertain future, but dark clouds began to gather, as great thunder rolled and lightening flashed, threatening to shatter the multitude of ‘precious’ mirrors. Suddenly, the form of ‘Borja, The Great Mighty Heir’ filled the doorway, lit by a single shaft of ghostly light. Terror descended. The people shivered with fear. Pausing, ‘The Great Mighty Heir’, with his inimitable stutter (a sure sign of true aristocratic breeding) began to read out passages from Hola Magazine, that most ‘precious’ of avant-garde gazettes: ‘G-g-gggg Gggigive me my Dddddog, my Dodododgy Ggggg-Goya. This is my uneq- eq- eqqqqq, un-eq, my un-eqqqqquiqui-, my uneqqqqui-vocal right!’, he finally roared in his booming voice. It was later said that at this exact, precious moment in time, The King, who was not present but many hundreds of miles away, felt a sharp pain in his side and began to fear the worst for his magnificent, ‘precious’ friend, Tita Thyssen, and lo he was grieved!! And with a last whimpering roll of thunder he was gone. The Great Impressionables had spoken. And so it was that The Great Accumulator’s ‘precious’ paintings were saved for the Spanish nation forever. Or as long as the Four Amigos can keep reaching deep into the wallets of the precious people of Spain. 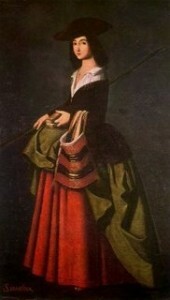 Another Dodgy Painting: Allegedly a 'Santa Marina' by Francisco de Zurbaran. Soon to be housed at the Carmen Thyssen-Bornemisza Museum in Malaga?